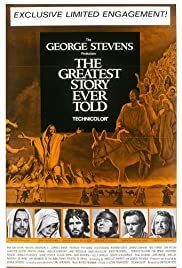 As someone who had read the Bible and knows what goes where, I am easily critical of too-Liberal Biblical movies, which is usually the case....except for the last 40-some years when hardly any films were made on this subject at all. My point is that this film gets toasted a lot, even by Christians, and I think unfairly. Yes, I became a bit annoyed the first few viewings when I would hear Jesus' speeches way out of order, or a few other things that really weren't 100 percent on the mark....or it just simply dragged. However, after a long absence and my first look at this on the ultra widescreen (2.75:1) DVD, I was impressed. For instance, the scene with the Last Supper shows everyone at the table, which is impossible to do in a formatted-to-TV mode. There are other similar panoramic shots that are very impressive. gave me a new appreciate of the work director George Stevens did here. Of course, he was one of the best in his profession so it's no surprise this is nicely filmed. Upon that recent viewing, I was please that none of Jesus' quotes are inaccurate and I have never had a problem with Max Von Sydow's portrayal of Christ. He had a penetrating eyes and spoke his lines with authority. Why he, too, gets bashed by a few people is unfair. He was just fine. It's a sanitized message, nothing that "preachy" to turn off the unchurched, but I do think it was a bit too slow to go three hours and 20 minutes. In this case, lopping off 15-30 minutes might have helped. It's still worth viewing, no matter what your "religious" views.